Has Best Buy Found Its Magic Carpet Ride? Can a SolarCity partnership spark sales for this blundering Big Box Retailer? Best Buy Co., (NYSE:BBY) and SolarCity Corporation (NASDAQ:SCTY.DL) are teaming up in the unlikeliest of partnerships. With plenty of pessimists for both solar and big box retail, can this new partnership boost sales? SolarCity Corporation announced Wednesday that it is joining forces with Best Buy Co., offer its services through approximately 60 stores in Arizona, California, Hawaii, New York, and Oregon . A survey of American homeowners in January found that while 62 percent of American homeowners are interested in solar power systems for their own homes, less than half realize that solar is much more affordable today than it was three years ago. Solar power is more affordable than it's ever been, but too few people realize it's a viable option for them. SolarCity is trying to change that, with help from Best Buy. For Best Buy Co., customers who sign up for solar before Earth Day (April 22), SolarCity Corporation will even throw in a $100 Best Buy gift card . Will Big Box Retail Work? The Honda-SolarCity partnership made pure financial sense, but SolarCity's Best Buy Co., arrangement is a much bigger bet. While Best Buy remains the world's largest multi-channel consumer electronics retailer in the world , sales have been stagnant as earnings tumbled 45% in the last five years. 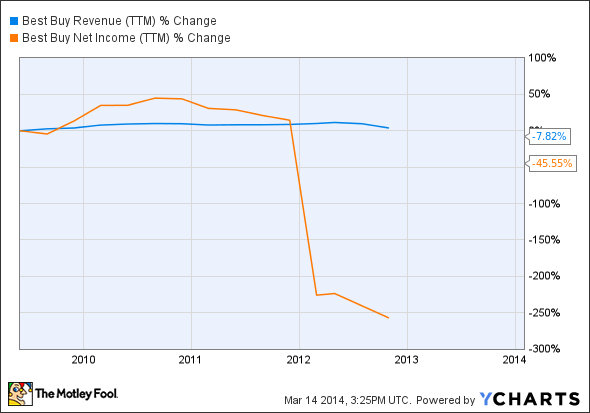 BBY Revenue (TTM) data by YCharts. But there's a very specific reason Best Buy has been on the chopping block: consumers don't care about testing electronics anymore. The days of "trying out" a computer or TV are over for most Americans. Heading to Amazon.com and checking out the stats is enough for the majority of buyers – and it can be cheaper and less time-consuming, too. But consumers are still hesitant to add on solar to their rooftops. As SolarCity Corporation notes, "[t]here are tens of millions of empty rooftops in the U.S., but still fewer than 500,000 photovoltaic (solar electric) installations ." For wary customers, heading to Best Buy Co., provides an unprecedented opportunity to see solar in action. While SolarCity Corporation has always prided itself on customer service (including its solar consultations) easily accessible retail stores with name brand recognition like Best Buy's might be enough to motivate many more Americans to make the solar switch. While SolarCity stayed mum on any financial details, it's likely that the solar company's got very little on the line. With only 60 stores, it's a pilot project for both corporations, and Best Buy Co., will need to prove itself as a profitable partner before it sees a major slice of sales. For now, it's a low-risk potential win-win for both companies. And if it works, it might just be Best Buy Co.,'s ticket out of a blown business model.